Welcome to the Parkville Tennis Club official web site. 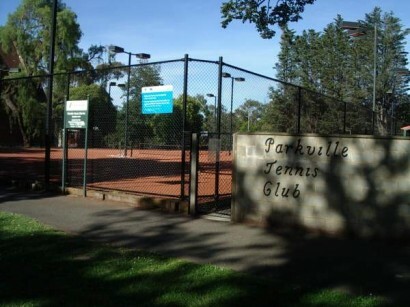 Parkville Tennis Club is located at 151 Royal Parade, with 3 lit en-tout cas courts, not far from the Melbourne CBD. !! !Come and Play for free!!! These are free events for all standards. There will be a light supper provided. Hopefully the weather will be kind. If you are a visitor or thinking of coming back to tennis, for $5 you can join in Sunday social tennis after 2pm. Club social is held every Sunday from 2pm. Last Sunday of the month is free. Enjoy great social tennis, meet new people Loaner racquets are available. SENIORS TENNIS IS HELD EACH WEDNESDAY for all skill levels(weather permitting). Come and enjoy a hit and morning tea.� LOANER RACQUETS ARE AVAILABLE. For tennis, Seniors are over 35!!!!! But if not yet 35 call to discuss. If you are a beginner or just coming back to tennis, our Wednesday morning offer would be the best fit for you. ON FRIDAYS FROM 8.30am TO 11.00 This session is aimed at proficient tennis players of all ages. Free Social tennis with afternoon tea.